I have to admit it. I stole this idea from Stella Harding, a British basket weaver and blogger. I was looking for a way to expand the study of patterns with my Grade One students past a simple AB, AABB, AAB kind of thing. I had a smart bunch of kids, and I wanted to challenge them. 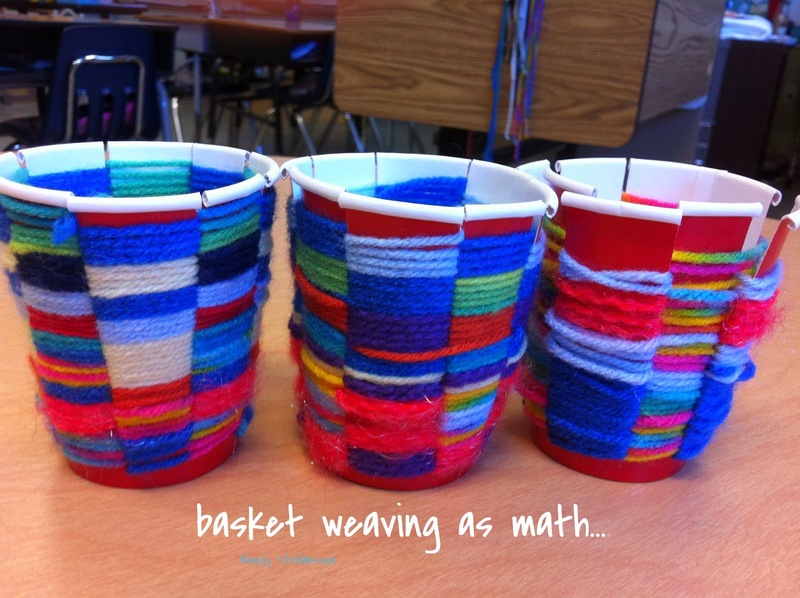 Basketry as patterns in three-dimensional space -- I loved it! This particular project is done with a weaving technique called "twining," which I had to research. Here is the Nancy Jacobs video from which I learned how to twine. This video is too complicated for little kids, but it was helpful for me to understand that twining is essentially weaving with two strands at the same time. Next, I "measured" many, many arm-lengths of different colours of yarn, including some that were variegated. I tied these together in contrasting pairs with a simple knot at one end. Most of the kids used approximately eight of these double strands. To begin, slide the knot from one pair of strands down a slot in the cup to the bottom. The knot should be inside the cup. Place one length of yarn on the outside of the cup, and the other on the interior. Weave strand A over a spoke of the cup and back inside; then do the same with strand B around the next spoke. Keep alternating until you run out of yarn; then start another pair of strands in the same manner. It sounds complicated, but it really isn't. Somewhere along the line, I reduced the process to a simple song, based loosely on the tune of "Skip to my Lou". It went something like this: "The (blue) goes in where the (black) comes out. The (black) goes in where the (blue) comes out. The (blue) goes in where the (black) comes out. That's how you weave a basket." Substitute different colours as necessary. My kids who tried to cheat the process by weaving all of strand A and then all of strand B discovered that although it looked right, it didn't hold together very well, and often the yarn slid right off of the cup/support. Meanwhile.... because the kids had to have something to work on while they waited for me to come around and get them started... I gave them an Op Art colouring page which (by happy coincidence) was essentially a two-dimensional representation of the twining process they were doing in three dimensions with their cup and yarn. 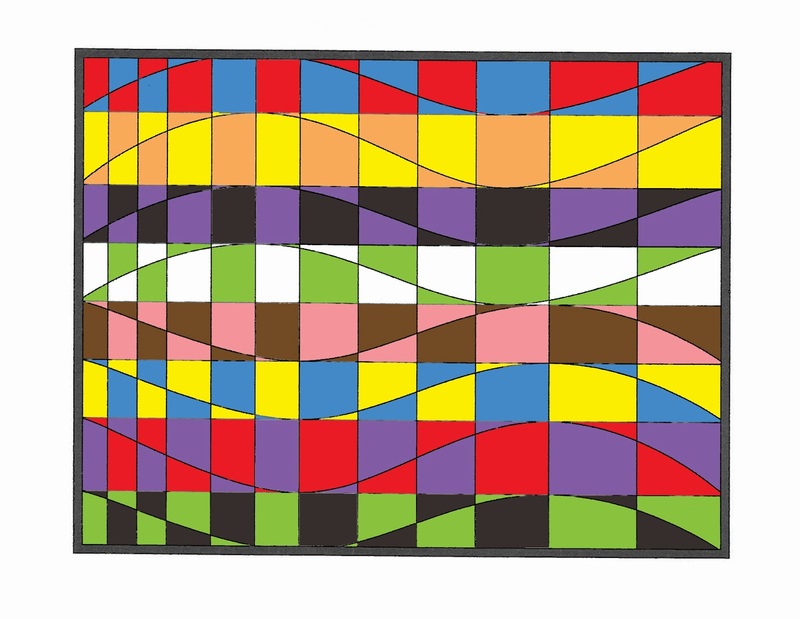 It is based on a painting by Victor Vasarely, and you can find it here. I showed them how to colour the top band of the first section in an AB pattern using two colours; then the bottom band in the same section in a BA pattern with the same colours. In each subsequent section they could change the colours. I loved what my kids were able to do, though I'll admit it took a few weeks. 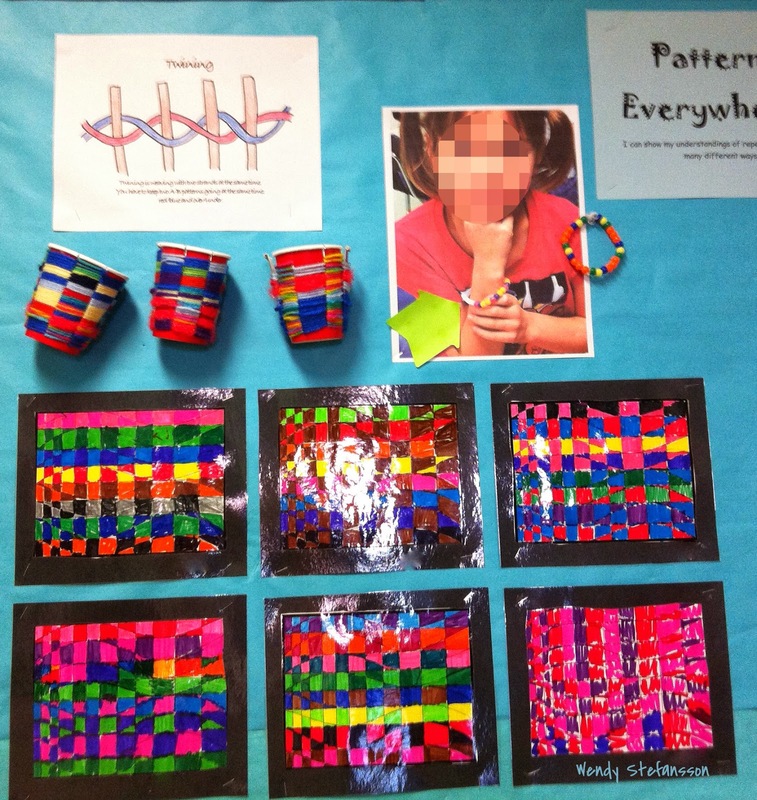 A portion of my "Patterns Everywhere" bulletin board.